You are here: Home > MCSD News & Alerts > MCSD News & Alerts > CMS News > Hurricane Harvey Relief Effort Update! – Let’s FILL THE TRUCK! LET’S FILL THE TANTARA TRUCK! 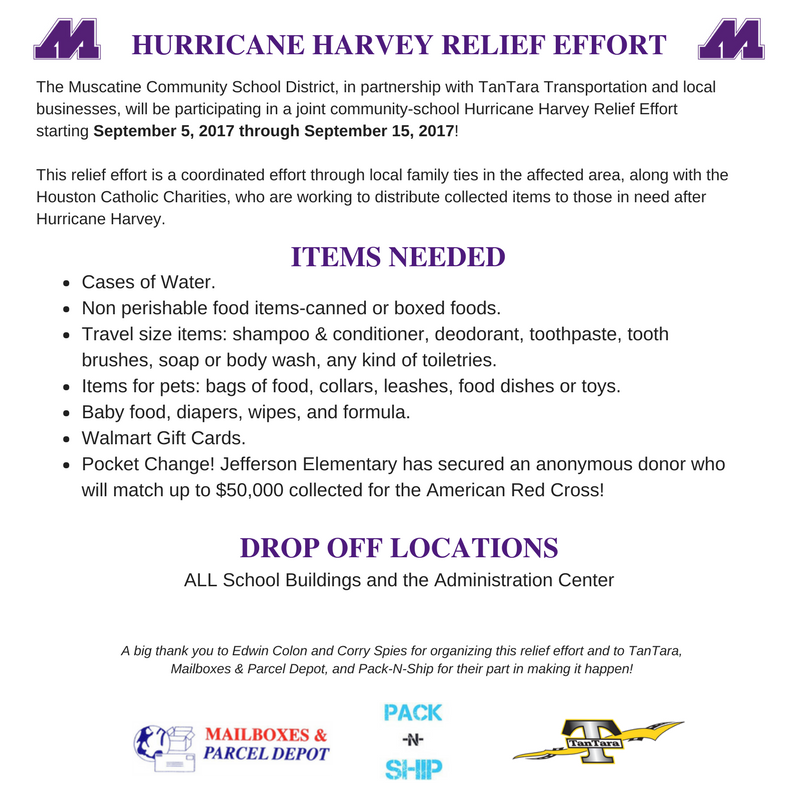 The Muscatine Community School District in partnership with local businesses is collecting needed items in a joint school-community effort to be sent to Texas for those who are affected by Hurricane Harvey! Starting tomorrow, Wednesday, September 13 at 1 p.m., TanTara Transportation Company will have a semi at HyVee and will be accepting donations for Hurricane Harvey Relief! The truck will be there through the end of the day Friday, September 15th. Come out and say hi to our students and staff and help us fill the truck! The semi will also be part of the Muskie Homecoming Parade on Thursday, September 14. You may bring your donations to the Homecoming Parade as we will have students and staff walking alongside the truck filling it along the parade route. The Homecoming Parade starts at 6 p.m. and will travel from Grant Elementary to the high school. Muskie Cheerleaders will be collecting donations throughout the game. Bring your items and find a cheerleader! All buildings and the Administration Center will be collecting donations. If you are donating cleaning supplies, please bring those items to the Administration Center so that we can keep harmful chemicals away from our students. The district has secured an anonymous donor who will match what is collected up to $50,000 so if you do not want to donate needed supplies, feel free to donate monetarily. You may donate cash and/or write a check to the American Red Cross! See the flyer for additional items needed!